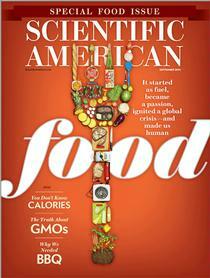 Scientific American is one of my favorite magazines- it educates, informs and occasionally even entertains. The September 2013 special issue on Food is quite broad in its appeal and touches on a host of issues including food science, food processing and even food politics. The editorial “Fight the GM Food Scare” says “mandatory labels for genetically modified foods are a bad idea”. As a food entrepreneur, an academic and a student of agriculture; I have been siting on the GMO fence, not clear on how corporates and governments must react. So this issue of Scientific American for me was very timely. The editorial helped me make up my mind. The are wrong. Here’s why. “The issue is in no way simple”, it stated in the first paragraph. Such an editorial beginning promised deep analysis, but soon disappointed. It made a weak argument against GMO labeling and a strong one in support of genetic crops. The premise is that if you support genetic research you must oppose labeling. This is simplistic. “tinkering with our Food’s DNA since the dawn of Agriculture”. There is a fundamental difference in plant breeding between mutation, hybridization, tissue culture and GMO, particularly as they pertain to labeling laws. Prop 37 in California had reasonably tight language that requires that to be labeled GMO genetic material has to be changed through DNA injection or cell fusion that breaches a “taxonomic family”. Effectively, hybrid varieties of crops are not GMO. For a scientific journal to not point this out, is tantamount to intensifying misconception. the article bemoans, making us believe the hapless Europeans have no high quality food choices! Europe mandated GMO labeling almost 15 years ago. Today Europeans are significantly healthier and leaner than Americans and their supermarkets have great products. I was shocked to learn that today “…70 percent of processed foods in the US contain GM ingredients”. Yet, we debate whether GMO labeling is needed. Honestly, what would we rather have? A 70% certainty of GMO foods for dinner, a near 100% certainty of non-GMO or that ignorance is bliss? “Because conventional crops often require more water and pesticides than GMOs do, the former are usually more expensive”. Here is another dubious argument that is alarmist and trifle ignorant. Alarmist because of its tone and ignorant about how discerning, farmers really are. The brutal truth is agri-companies have no interest in selling GMO crops hat don’t need chemicals. Monsanto and Syngenta are mere poster children and they are not alone. So why label, they ask. This sounds petulant and childish. So why not make the reverse argument, i.e. support GMO labeling and let “value-seekers simply buy cheaper products”! Maybe the truth is they want no food labeling-be it GMO, organic or nutritional. So what if consumers don’t know. At least they won’t misunderstand! The editorial reinforces support for genetic crops by referencing a seven-year study in India about GMO crops that gave farmers “a 24% increase in yield and a 50% increase in profit”. It fails to mention this study was not on a food crop but on Bt Cotton (owned by Monsanto) and while results were promising, they have not been replicated elsewhere. Or that the farmers in the study used more chemicals than normal and not less. A Govt. empowered panel is investigating these results and their report is imminent. “Green peace and other anti-GMO organizations have used misinformation and hysteria to delay the introduction of Golden Rice in Philippines, India and China”. Golden rice is instructive. Developed by the International Rice Research Institute (IRRI) in the Philippines and now owned by Syngenta, it supposedly produces beta-carotene that helps prevent blindness. It is a GMO that has broken a species barrier. It comes impregnated by genes from corn and bacterium. But expecting governments to approve this, using the argument that it is generally recognized as safe (GRAS standards) is not setting the bar high enough. I have met with literally thousands of farmers in my years in the Agri-business and I know that if they believed GMO crops would use less water and pesticides (and by the way, prevent blindness in their children) there would be a stampede in their rush to GMOfy and they would literally overturn governments if policy and laws stood in their way. Do the editors really think that the Governments in China, Philippines and India don’t want to prevent blindness in 500,000 children annually by simply waving the Golden Rice wand? Or they want to keep their farmers poor? Concerns about GMO foods need to be heeded. Its impact has not been fully studied or understood. We are still in the discovery phase and the road to iteration, development and documentation is long and arduous. Supporting GMO labeling need not mean opposing genetic research. Eventually both sides will win this battle. Genetic manipulation seems embedded in our evolutionary gene and the future is likely to be filled with genetically modified organisms as science improves and corporations become more responsible. Equally, GMO labeling will continue to evolve as consumers become more aware and governments more responsive. For now a tentative start in GMO labeling is better than keeping 300 million consumers in the dark. That's not what a free society does. We should embrace knowledge-sharing and not “shun it based on unfounded fears. The editors in this article are simply making the point that GMO labeling will make a serious dent in R&D efforts and product proliferation of GMO foods. Clearly, they are strong supporters of GMO foods. They make the case both in this piece and in an article in this issue, that the planet needs them and science has proven them safe. Regardless of that, I think their point is reasonably well made. There is no doubt that GMO labeling (combined with the fear-mongering of the anti-GMO lobby) will have a huge impact on both R&D and the industry. The editors are not bemoaning the fact that it is virtually impossible to find GMOs in European supermarkets. They are simply stating that mandatory labeling scared away consumers and killed the industry there. The anti-GMO lobby in the US has understood this and is trying to beat the big corporates at their game—by generating a groundswell of consumer rejection. The impact on research is already being felt. Food companies are already making contingency plans and grant money for GMO research in academia has started to dry up. After all, it is hard to make public funds available for product research that lacks popular support. There is nothing wrong with more transparency, but we should accept that, for right or wrong, it will significantly hamper the progress of this field. Very good article. You missed one thing. The Scientific American editorial states. ““The U.S. Food and Drug Administration has tested all the GMOs on the market to determine whether they are toxic or allergenic. They are not.” In fact, the FDA has conducted no tests at all it relies on the companies bringing GM foods to market to undertake any testing, and even this is only voluntary. It's astonishing that the ditorial pontificates on these issues without even having a grasp of the basics.